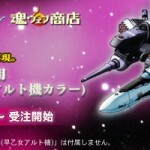 Tamashii has announced full armor for their Macross Frontier 1/60 scale DX VF-25F. This is exclusive to their webshop. Alto’s VF-25F was seen with the full armor during the later half of the series, and was used in the season finale.